It has been nothing but cold and gloomy where I live for what seems like forever (okay, maybe about a week). I’m trying not to let the cloudy skies push me into a state of lethargy, so even on the nights that I feel like plopping down or ordering take-out, I told myself that I’m still going to create easy and healthy meals for my family. 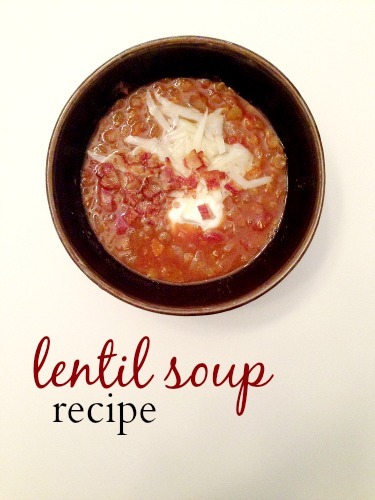 This lentil soup is easy, quick, and has lots of nutrients that make our bodies happy. Lentils are inexpensive and are a great source of fiber and protein. Plus, hot soup is really great for these gray and misty days. In a large Dutch oven, cook the bacon over medium heat until cooked through and crisp. Remove the bacon from the pan and let cool on paper towels. Crumble and set aside. Add the onion, carrots, and celery to the pot (there should be a little grease leftover from the bacon) and cook until tender, about 6 minutes. Add the cumin and stir until fragrant. Stir in the lentils, diced tomatoes, and chicken broth and bring the mixture to a boil. Reduce to a simmer (about medium-low heat) and allow to cook, stirring occasionally, until the lentils are tender, about 35 minutes. Add salt and pepper to taste. Serve the soup with the reserved bacon crumbles, shredded cheese, and sour cream.